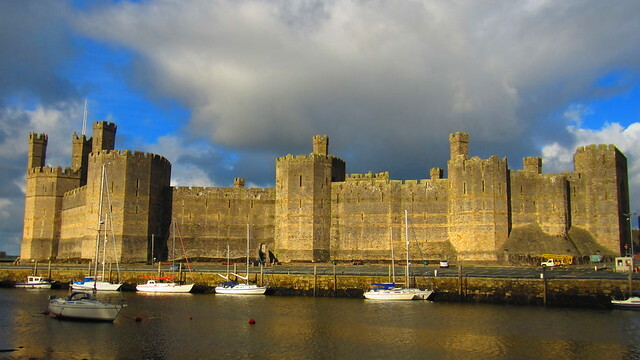 Caernarfon Castle on the Afon Seiont | Flickr - Photo Sharing! This was one of the photos that I took from the other side of the foot bridge by the Anglesey pub, that Ma Zhengfang guided me to, so without her help I'd have never found this shot. This majestic castle was built over 700 years ago, and was inspired by Roman, Constantinople, and Arthurian architecture. It sits on the intersection of the River Seiont, and the Menai Strait, and was a symbol of British rule over the Welsh; to the Welsh it was also a source of resentment towards the British.